At Storage Direct, we believe the point of self-storage is to make everything as simple for you as possible. That’s why we make an effort to walk you through the storage process step-by-step, answer any questions you have, and even put together a guide so you know how storage works. When you use one of our self-storage facilities, we want you to know exactly what you’re getting and exactly what you can do to get that. That’s why we’re using this blog to answer the kinds of questions that we get all the time. Questions like…wait. What? Some of these questions are…specific. Most of them are about what we expected to answer but…Why would anyone need to know that? You’re not going to commit some sort of crime, are you? Wait. Don’t tell us. Some questions are better left unanswered. …Well, we love our customers… So we guess the least we can do is answer your weird questions, too. 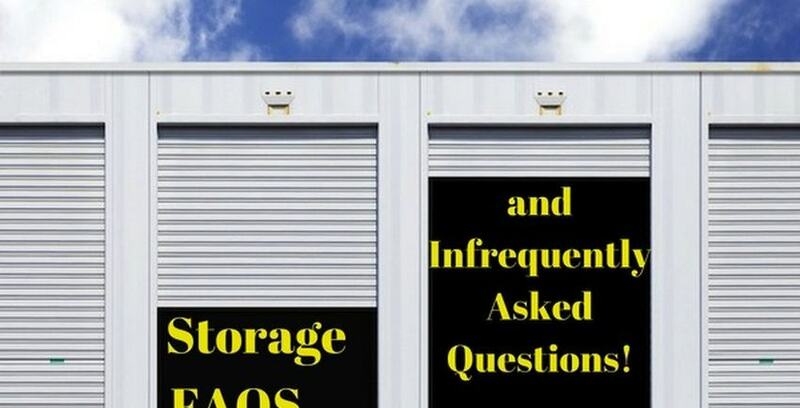 Hopefully, this FAQ and, uh, iFAQ will help you figure out whether self-storage is the right solution for you, no matter how…eccentric your needs are. Wait. Are you Batman?! How Safe Will My Stuff Be? The specific security we employ to keep our customer’s belongs secure varies based on our facilities. We keep an exhaustive list of the amenities, including specific types of security, available at each facility. That means, when you select a storage unit online, you can find a facility that has the types of security you want before you have to commit to a location. No matter which facility you choose, your belongings will be kept safe by at least two security measures: the front gate which requires a code, and the storage unit door which requires a non-duplicable key. In addition to these standard security measures, we keep a manager on-site during business hours. This manager is here to answer questions, help customers, and keep an eye on the facility. If you’re looking for additional security, our facilities can offer 24-hour video surveillance, electronic gates, 24 hour bright lighting, and even individual door alarms. In case your arch nemesis somehow gets past all of these defenses (we’d like to see them try! ), we ensure any belongings you keep at any of our facilities with the StoreSafe Leasing program. Most of our facilities are gate-accessible 7 days a week for extended hours, such as 6 am to 9 pm. Specific availability depends on the facility you choose. Some of our facilities are accessible 24/7/365, in case you need a gadget for some… nocturnal crime fighting? Office hours are usually a little more conventional (we can’t all sustain ourselves on only meditation, energy smoothies, and an undying lust for justice), but depending on the facility you choose, you can be sure that someone human will be available on-site to help you with whatever you need. Since justice never sleeps, make sure you look into Holiday and 24/7 accessible options. If you go with one of those units, you’ll be able to access your storage literally whenever you need it. What If I Have To Keep Something At EXACTLY 69 Degrees? …Is this a trap? You’re trying to get us to ask you what it is, aren’t you? Do you need to keep updog at precisely 69 degrees? Well it’s not working! You know why? Because you CAN keep up dog, or whatever else you’re storing, at exactly the temperature you need it to be. Many of our facilities offer climate-controlled storage, and some of these units will even let you manually set your own temperature via a personal thermostat. Ask the on-site manager at your facility or give us a call and we can accommodate you. You can also try your joke again if you call. The people who answer the phones probably aren’t quite as canny as the blog writer is (please don’t tell the phone people we said that. The phone people are much bigger than the blog writer). What Happens If I Forget My Gate Code? Don’t worry; it happens to all of us. We swear, we’ve forgotten how many times we’ve forgotten our gate code. What you’ll have to do is either call a schedule an appointment with the manager of your facility, or come in anytime during their office hours. You’ll answer some questions so that the manager can verify that you’re the person who should be getting access to your unit (so as to keep shapeshifting villains out), and then you’ll be given the gate code. Please note, however, for security purposes we can’t give out the code over the phone or to anyone other than the person who signed the original lease agreement. Can’t do it. Deep hypnotic brain training conducted in secret self-storage facilities in the Forgotten Lands gives Storage Direct employees the ability to resist any known form of physical, psychological, or psychic torture devised by man without divulging your gate code to your enemies. Try getting dedication like that out of Robin! Kid’s a punk, we tried telling you. What If I Decide I Need A Bigger Space? This is something else that happens all the time. We feel bad about it, too, because our customers tend to be really apologetic and self-deprecating when they come to us about it. There’s no need for that! It’s totally understandable that you’d pick out a unit, and then when you get there and see it or start unpacking, you realize you need more space than you thought. It’s hard to gauge how much space your belongings take up until you actually see it. That’s why Storage Direct does unit transfers with no transfer charge. You just start paying for the new unit once you’ve moved into it and stop paying for the old unit when you move out. Nobody is inconvenienced, nobody has to feel bad. You can transfer units as your needs change as much as you want. Whether you’re looking to upsize or downsize, just let us know and we can accommodate. What If I Need To Esca–I mean…leave…VERY, very quickly? When Can I Move Out Of My Space? Wow, ok first of all: rude. We were just spitballing. Yeesh. No wonder Gordon is the only guy who’ll work with you; you’ve got no respect for the collaborative process! But if you weren’t just making a hurtful comment about how you wanted to get away from us, the answer is: whenever you want. You’ll just have to give us a 10 day written notice of when you’re moving out. The minimum period of time you can rent a storage unit for is two weeks. Our payment policy is month-to-month with no “final month” charge, so you don’t pay anything extra for moving out, no matter when you decide to do it. Just give us 10 days to prepare for your tragic exit out of our lives/storage facility, and we’ll see you off no problem. Do You Have Moving Supplies Available? Most of our facilities offer boxes, tape, and other moving supplies for sale. We also offer carts and other tools to help you move the belongings you bring to our facilities. Some facilities will even be willing to rent you a moving truck. Check online to see which facilities offer the moving amenities you’re looking for. If you need boxes, bags, tape, or any other kind of moving supply, just come by during office hours and we’ll be sure to set you up right. What If I Needed To Keep, Let’s Say… A Highly-Specialized, Delicate Vehicle In An Inconspicuous Place Where It Would Be Safe But Also Where I Could Access It The Moment I Needed To Make Use Of It? Ok, wow. You’re just dropping all pretense of not being the Batman at this point. Yes, we can store the Batmobile for you. We could also store the Batcycle, the Batboat, and even the BatRV if you needed to. Vehicle storage is yet another amenity offered in several of our locations. Just come to one of our applicable facilities and we’ll have a unit that can accommodate even that glorified tank. Just… please don’t drive through the walls. It’s so expensive, and we can’t even bill Wayne Corp because we don’t have any proof of your connection to Batman! We hope this FAQ/iFAQ was informative and helpful. We want our customers, super and otherwise, to know exactly what they’re getting when they choose Storage Direct: the best self-storage company in the business. That’s the only reason we put this together. This definitely was not an application to be your new sidekick. It was not that. HOWEVER, we really think it might behoove to consider our proposal: a SELF-STORAGE based crime fighter! The catchphrase we’ve been working on is “If I ever want to see this city cleaned up, it looks like I’ll have to do it myself!” or maybe “I’ve got a storage unit just for you, evildoer–a Federal prison cell!” Pretty good, right? When you’re ready to ditch that loser in the green tights, give us a call anytime. We’ll be in our costume waiting by the phone. Together, Batman and the Storage Director will put a stop to evil once and for all!